Central London was once again brought to a standstill this morning by angry bikers protesting at a parking tax imposed on them by Westminster Council’s former Cabinet Member for parking and transportation, Danny Chalkley. Although Danny Chalkley thankfully left his position last week, his replacement, Councillor Lee Rowley, has yet to get used to the idea of seeing his borough brought to a standstill every week, unless he scraps his predecessor’s much hated motorcycle parking tax without delay. Motorcyclists meet every Wednesday morning at 7.30 (hence the name of “Wednesday Morning Breakfast Club”) and start congesting the roads of Central London by riding their bikes as if they were driving cars. So if there are 100 bikes, that’s the equivalent of an additional 100 cars on the roads during rush hour, when everyone is desparately trying to get to work. So far, the Police has not managed to arrest or fine any bikers purely because there is no law or rule in the highway code that forces motorcyclists to filter through heavy or stationary traffic. Traffic filtering (or lane splitting) is at the discretion of the bikers, who are under no obligation to move forward in between stationary cars if they don’t want to. The bikers start with leaving plenty of space in between them, like cars do, and ride at the minimum legal speed on a major roundabout, causing complete chaos on all the surrounding roads. Within minutes, the traffic becomes stationary and the bikers delibarately choose to remain stuck like cars to add more chaos. This morning’s session was slightly different from the previous ones in that Westminster City Council and Transport for London (TfL) had asked the Metropolitan Police beforehand not to turn up to try and regulate the traffic, as they did on previous occasions. According to what we’ve heard, the aim was to discreetly keep an eye on the bikers by CCTV in the hope that they would do something wrong, could be arrested and this weekly chaos could be stopped. Yes, you’ve got it, that’s British democracy. If Westminster City Council and TfL are so keen to see the Wednesday Morning Breakfast Club scrapped, why don’t they scrap the bike parking tax, instead of wasting their time with useless and anti-democratic dirty tricks? The bikers this morning behaved like exemplary car drivers while peacefully and legally causing gridlock absolutely everywhere, to the extent that the Police had no reason whatsoever to arrest or fine anyone while admiring the traffic chaos from the comfort of their own office. We were amazed to see so many emergency vehicles trying to squeeze in the stationary traffic, as if they were dozens of citizens who had suddenly fainted or were involved in last minute accidents. Some believe that this was another dirty tactic of the local authorities to try to make the traffic move a bit, but all it did was to bring even more chaos on the roads as there was no room available for cars or buses to move forward. In the past few weeks, the bikers blocked the Trafalgar Square roundabout, although this morning, they first decided to hit Lambeth roundabout instead, just so to confuse everyone. The Met Police officers and TfL staff, who were monitoring the behaviour of the bikers very closely by CCTV, must have been very confused when they saw the usual Trafalgar Square roundabout all empty. 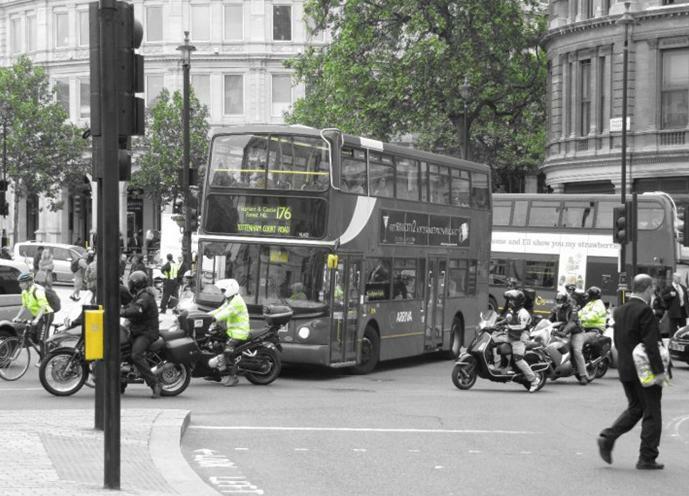 This shows that the bikers are free to hit any location in London they like without prior notice, and unless Westminster City Council scrap their motorcycle parking tax immediately, we are told that the roads of Central London will be gridlocked every single morning from June onwards. 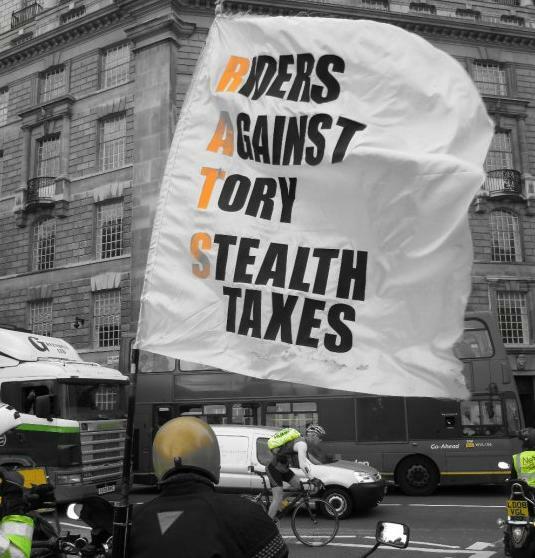 The bikers are more determined than ever to stand up against Westminster City Council and any other UK authority that dares to introduce anti-bike legislation to raise revenue. Talking is now over, direct and disruptive action against the authorities is what makes the voice of the bikers heard. TREAT BIKES LIKE CARS AND THEY’LL BEHAVE LIKE CARS EVERY DAY OF THE WEEK UNTIL FURTHER NOTICE! Next week will be an everyday + evening club. Westminter City will never be the same again unless the bike parking tax is abolished. La semaine prochaine les manifs se produiront tous les jours + le soir. L’arrondissement de Westminster ne sera plus le meme, a moins que la taxe de stationnement moto soit suprimee. L’aspect mystérieux des véhicules de secours et keufs ont été, paraît-il d’un canular et les commentaires du président de NTBPT donne cette crédibilité croyance. Les politicards pensent que personne ne mettra en doute leurs actions, mais c’est la première fois qu’ils se heurtent les motards/scootards. Ils apprendront. Les manifs se poursuivront. The mysterious appearance of emergency vehicles & police were, it seems a hoax & the comments of the chairman of the NTBPT gives this belief credibility. Politicians believe nobody will ever question their actions but this is the first time they’ve come up against bikers. They will learn. The demo’s will continue. This of course will also have the positive impact of encouraging more folks onto 2 wheels. Lids off to the Breakfast Clubbers!